"41MR12, Burial I, 55" by Timothy K. Perttula and Robert Z. Selden Jr. VESSEL FORM: Globular compound bowl with peaked rims; the rims are otherwise direct, with flat and exterior folded lips. There are two suspension holes on the upper panel, just under the lip. DECORATION: The upper panel of the compound bowl has a simple scroll motif repeated four times across the panel. Each of these scrolls is separated by excised hour-glass shaped areas and there are excised zones both above and below the scroll on this upper panel. The lower panel has a single horizontal engraved line at the top, followed by two series of four circles repeated four times across the panel. The innermost circle begins as an interlocking engraved hooks or arms. There are engraved tick marks between the sets of circles. 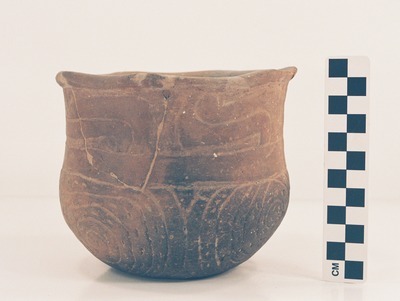 Vessel MR12-55, a Ripley-Taylor Engraved compound bowl from Burial I: a, photograph; b, drawing by Bobby Gonzalez.